Deer can be annoying pests. They cause damage to residential properties and gardens by stripping the bark from trees and eating or stepping on plants. Fortunately, deer are selective feeders. They choose the plants that they eat. According to Cornell University, much like humans, deer won't return to the same location to feed if they didn't like the food there. 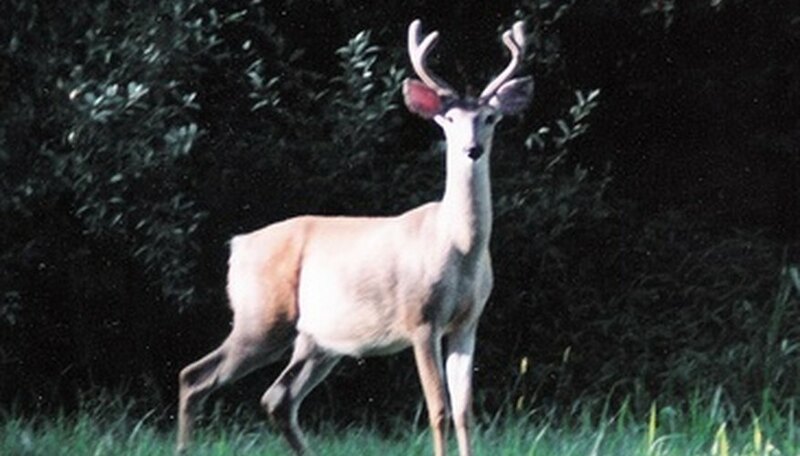 Yarrow, catmint and snapdragon are among plants deer find offensive. Yarrow (Achillea millefolium), a member of the aster family, grows as a simple, upright and hairy stem, usually under 3 feet tall. This perennial blooms between June and September. Densely arranged in flattened clusters, the flowers have five petals and come typically in white, yellow, pink or pale purple colors. Yarrow’s leaves are lacy and look like feathers. The foliage emits an aroma, especially when crushed, which deer find offensive. Use yarrow near fences or garden borders to prevent deer from entering your garden. Yarrow can endure dry, impoverished soil and requires very little maintenance. This is a spreading plant, so make sure to give it plenty of room when first planted. Ideal for USDA zones 3 to 9, yarrow requires full sun and an optimum soil temperature of 60 to 65 degrees F.
Also known as catnip or blue wonder, catmint (Nepeta x faassenii) is a perennial flower that can thrive in USDA zones 3 to 9. Catmint is one of the toughest perennials you can grow that can repel deer. Preferring full sun to partial shade, catmint can survive in hot, dry weather and produces silvery foliage and blue flowers. Branched stems are erect, very leafy and covered with a downy gray hair. Heart-shaped, toothed leaves are grayish-green. Clustered white or pale lavender tubular flowers with purple spots bloom from July to September. Catmint can grow up to 36 inches tall and spread up to 24 inches wide. Deadhead or cut back hard after first flush of bloom to encourage more flowers. The aromatic scent of catmint flowers and foliage helps deter deer, rabbits and elk. Snapdragon (Antirrhinum majus) is an annual that is an ideal border plant. It displays a variety of flowers, on one or several stalks, with colors ranging from pastels to dark shades of burgundy, cream, orange, pink, purple, red, white or yellow. Densely packed along stalks, the lipped-shaped flowers are about 1 inch wide. Flowers bloom from early summer to midfall. Snapdragons are hardy to USDA zones 6 to 10 and prefer partial to full sun. They prefer well-drained sandy and clay loam. Snapdragons are easy to grow from seed, but it is best to transplant them as young plants to ensure they root-in before they start flowering. They can tolerate light frost, so you can plant them early. Deadheading is necessary to keep the plants in bloom.